Essentially a lung simulator. Metabolic calibration kits create known VO2 & VCO2. This variable speed motor-driven calibration syringe will check the accuracy and repeatability of any flow sensor over the range of 6 to 80 breaths per minute. Produce an exact, simulated VO2 and VCO2 to verify the overall accuracy of a metabolic measurement system and its software. VO2 measurement systems using inhaled ventilation measures (with reversed Haldane Transformation) may use the Metabolic Calibrator by positioning the flow sensor backwards (with respect to its normal flow direction) on the expiratory side of the breathing valve (between the expiratory port and the mixing chamber). Most flow sensors are typically calibrated with a fixed volume manual syringe, but little is known about the performance of that flow sensor over the whole physiological range, typically 6 to 60 breaths per minute. So how does this affect the accuracy of your ventilation measurements (and ultimately VO2) when you have calibrated the flow sensor at some unknown manual stroke speed, then use the sensor for low-flow pediatric or resting measurements, or high flow VO2 max measurements? Check the accuracy of any flow / volume measurement device. Simulate breathing rates from 6 to 80 breaths per minute. Check the effects of various gas mixtures on a flow sensor. Digital display of breathing rates (strokes per minute). The # 17051A accessory kit for above will produce precise Metabolic Calibration gas mixtures to calibrate VO2 and VCO2 in addition to the calibration of VE. The # 17054 mass flow meter metabolic accessory kit for models 17050-3 and 17050-4 will produce precise Metabolic Calibration gas mixtures to calibrate VO2 and VCO2. 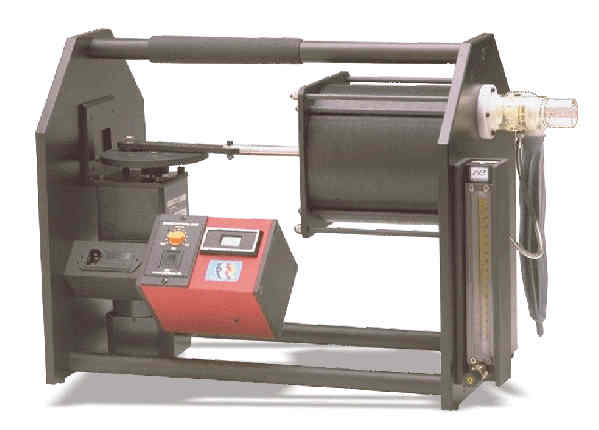 It provides highest accuracy and ease of adjustment. No. 17054 may be ordered instead of # 17051A. Volume Accuracy: +/- 5 ml. Motor speed is continuously variable from approx. 6 to 80 strokes per minute. Size: 12" (31cm) wide x 16.5" (43cm) high x 31" (77cm) long. Add 3" length for Metabolic Calibration Kit. Models 17050-3 and 17050-4 with the 17051A or 17054 option can only be used for CPX systems that utilize expired ventilation measures for the VO2 calculation (most systems). Model 17051A requires manual flow adjustment of the metabolic gas mixture using a pre-calibrated rotameter as shown in above photo. In model 17054 the rotameter is replaced be a mass flow meter with digital mass flow display. The provided O2CAL.xls spreadsheet software enable precise determination of the selected metabolic rate and the percentage error of the metabolic measurement system being calibrated. The fact is that the VE measurement contributes most to your VO2 and VCO2 measurement accuracy. So what claims are being made for the accuracy of VE measurements? No mention is made of the accuracy of the VE measurement. If the accuracy is in fact specified, does it hold true over the whole metabolic range, i.e. from, say, 6 to 80 breaths per minute? Will the accuracy be maintained during and after a CPX test? Now you can check for yourself! What about the accuracy of your VO2 and VCO2 measurements? Do you really know? Do you trust the measurement because the manufacturer is a well-known company? Or did you compare it to the Douglas bag method? Perhaps you compared it to another so-called "well-known" system. Only Metabolic Calibration can check the accuracy of your CPX system. Our model 17051A or 17054 options for metabolic calibration make the above mentioned motorized syringe pump into a very accurate Metabolic Calibrator/Simulator. Metabolic Calibration uses the principle of mass preservation to create known VO2 and VCO2. The principle of mass preservation dictates that the chosen mass flow of CO2 and O2 remains unchanged regardless of the ventilatory dilution (i.e. the minute ventilation that delivers it into the system under calibration). Order option 17051A or 17054 separately. Metabolic Calibration accuracy is +/-1% VO2 & VCO2. A Metabolic Calibration gas containing 20.9% CO2, balance N2, is required. The calibration kits include an Excel file that allows you to make the required BTPS/STPD corrections automatically and print a calibration report. If you want to read more about Metabolic Calibration, click on "Dr. Andrew's Corner" and check out references 1 and 2. Software 17051-2 is included at no additional cost when you purchase 17051A, 17051-1, 17052 or 17054. We also offer Metabolic Calibration of any Metabolic Measurement System in your lab.